The sun set on the 1990s Honda Passport but it's rising again with the 2019 model. Honda's team has been hard at work preparing the new 2019 Honda Passport to hit dealerships next month. If the model name sounds familiar, that’s because the original Passport SUV was a product of a partnership between Honda and Isuzu back in the '90s. While the 2019 Passport bears almost no resemblance to its legacy nameplate, it does closely resemble its larger sibling, the Honda Pilot. That’s by design. Honda needed to slot in a more rugged SUV between the compact CR-V and the 3-row, family-focused Pilot to gain back the customers it was losing to competitors such as the Ford Edge and Jeep Grand Cherokee. So the Passport was (re)born. To help us get to know the Passport on a more personal level, Honda invited us to the off-road mecca of Moab, Utah to give it a test run in a variety of conditions. We spent an entire day in the 2019 Passport Elite trim, navigating rocks, mud covered trails and red rock-lined highways. Here's what we thought about the all-new styling, performance features, interior, and tech. We were introduced to the Passport at the rustic Sorrel River Ranch Resort where Honda set up a display vehicle complete with a kayak mounted to the roof racks. With Moab's temps in the 30s, we figured we'd wait until Spring to hit the river. To design the new Passport, Honda took the larger Pilot and made some tweaks to the body in order to create a more off-road ready vehicle. The Passport shares an underbody and the 111.0-inch wheelbase with the Pilot, but it loses 6 inches off the back and the 3rd-row seat to become more personalized. While the Pilot has become known as the quintessential family SUV, Honda's goal for the Passport was to create a more personal and more adventurous vehicle. Aggressive approach and departure angles (21.4 degrees and 27.7 degrees, respectively) in addition to an added inch of ride height, are the first indicators of its off-road chops. For comparison's sake, the Jeep Cherokee (non Trail-rated) has an 18.9-degree approach angle and a 25-degree departure angle. The Passport beats it out, surprisingly. A sporty, matte black grille makes a solid first impression. The front fascia is what sets the Passport apart from the rest of Honda's crossover lineup, and is also what we found most appealing about the exterior. A sportier, blacked out grille greets you with the promise of adventures ahead and the matted black extends to the LED headlights, fender trim, and the back bumper. The standard roof rails on the top Touring and Elite trims drive home the vehicle's adventurous spirit. The murdered out look comes standard, and it's very appealing. One design choice that surprised us was the standard 20-inch wheel on all trims levels. For a vehicle being marketed as off-road ready, we were expecting to see 18-inch wheels or smaller. 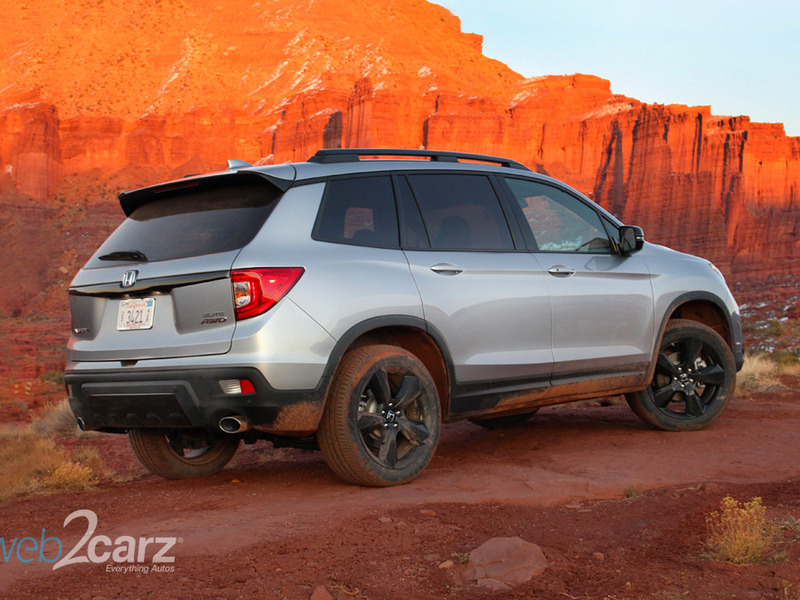 However, if Honda's goal is to balance off-road and on-road performance, the wheels will satisfy the majority of buyers who spend most of their time on well-paved streets. Do we wish the Honda Passport looked less like a Pilot's mini-me? Yes. Do we think Honda is playing their cards right by building on the success of their hugely popular SUV? Also, yes. If it ain't broke, why not spruce it up and sell it as a new model? The Passport was designed to serve drivers who need more off-road capability than the CR-V can provide but don't need the soccer mom passenger space (or stigma) of the Pilot. It especially caters to residents of urban areas who like to leave the hustle and bustle of the city and trade it in for unpaved trails. As Honda's engineering team put it, "it's urban meets backcountry". To see how the Passport performs on curvy highways and the rugged trails of Moab's Arches National Park, we set out on our drive shortly after the sun rose and didn't hand in the keys until it set over the red rocks. Here's what we discovered. We started on our Passport adventure with a highway drive to Arches National Park. All Honda Passport trims share a 3.5-liter V6, offering 280 horsepower and 262 lb-ft of torque, mated with a 9-speed automatic transmission. For the on-road portion of our drive, we enjoyed the quick acceleration of the V6 and the refined transmission which has been updated to be smoother and more responsive. The steering and handling were put to the test around the sharp curves we navigated on our route. The Passport conquered them without trouble thanks to Honda's Torque Vectoring AWD which overdrives the outside rear wheel to improve grip while cornering. Finally, the Passport's responsive brakes avoided any close calls with the cattle that have a habit of leisurely strolling across Moab's major roads. Many of the same drivers that will let the Passport roam free off-road, will also be interested in the SUV's towing capacity. They'll be able to tow an impressive 5,000 lbs with properly equipped AWD models. This matches the Honda Pilot's towing capacity and blows the CR-V's measly 1,500 lbs out of the water. When we arrived on our first off-road trail, the real fun began. We started the trail drive with some rutted roads and then took to the muddy and snow-covered trails to see just how much the Passport is willing to take off-road. This part of the drive was also where we got to put Honda's All-Wheel Drive system and Intelligent Traction Management to work. There was nothing on our drive that the Passport couldn't tackle, but it did get angry at times. Go over rock covered hills at anything faster than a crawl, and you'll immediately remember that you're not in a Jeep. Although rock crawling may not be its expertise, we were impressed by the high speeds we were able to reach on the muddy trails without losing traction. It's important to remember that Honda does not claim to provide the same off-road capabilities as Jeep in their line of off-road vehicles (and shows off with the rock scaling Wranglers in Moab). While our trails were tamer, going 55 miles per hour over muddy trails still provided plenty of thrills. The Elite trim comes standard with Honda's Torque Vectoring AWD and it is optional on all the lower trims. If you have the desire to explore any of the terrains we described, you shouldn't pass up the AWD on the Passport. The AWD system maximizes traction by distributing 70% of torque to the rear wheels and 100% of that torque from left to right. The Intelligent Traction Management system has 4 modes including Normal, Snow, Mud and Sand. It complements the AWD by letting you manually select your road surface and get the stability, torque or wheel slip you need for any condition. For most of the drive, we stayed in Normal mode, but for the muddier parts of the trail portion, we switched to Mud mode to feel the difference. In Mud mode, we were able to pick up more speed, but at the expense of the grip that Normal mode offered. If we had to describe the Passport's cabin in three words, we'd say 'simple, dark and functional'. There was nothing that jumped out as extremely premium or eye-catching, yet the black leather seats and soft-touch accents are practical and comfortable (even on full day adventures). The Passport Elite gets you all the creature comforts you want including heated and ventilated front and rear seats, heated steering wheel, and standard tri-zone climate control. The only color we spotted in the dark interior was the high-resolution 8-inch display audio touchscreen which we enjoyed using thanks to its responsiveness and user-friendly apps that mimic a smartphone. The volume knob can once again be found on most trims for those who despise using the slider to crank the tunes. We were happy to see both Apple CarPlay and Android Auto integration since CarPlay is the sole option for some automakers, limiting Android users' connectivity. Both Android and Apple users can cut the cord and charge their phones with the wireless phone charging pads on the Elite trim. Safety takes the front seat in the Passport with standard Honda Sensing technology on all trim levels giving you Forward Collison Warning, Lane Departure Warning, Lane Keeping Assistance System, Road Departure Mitigation and Adaptive Cruise Control. Each trim will include a Multi-Angle Rearview Camera while higher trims give you blind spot monitoring. Where the Honda Passport really shines is in its spacious and smart cargo areas. It leads all of its competitors when it comes to passenger and cargo room with 41.3 cubic feet of space plus 2.5 cubic feet in the underfloor. With rear seats folded down, you'll get access to 77.9 cubic feet of space for all your adventure or home improvement supplies. When you lift up the carpeted cargo cover, you'll find plastic cubbies to stash anything you want to keep out of sight or anything you just want to keep organized. You'll be able to get your hands on the 2019 Honda Passport in just a few days, starting on February 4th, 2019. The trims you can choose from include: Sport, EX-L, Touring and Elite. All trims besides the Elite can be had in either 2WD or AWD and the Elite comes with Honda's AWD standard. So who do we think should buy the new Honda Passport? Anyone looking for a comfortable on-road vehicle with the space to fit a ton of gear, great towing capacity, and moderate off-road prowess. We don't expect it to draw the hard-core daredevils, however. If we were to compare the Jeep Wrangler to an X-Games snowboarder, we'd give the Honda Passport the title of recreational skier. It's safe, dependable and occasionally adventurous.